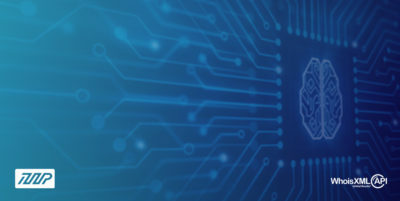 While WordPress is famous for its five-minute installation, it still takes a lot of time in setting up a full-fledged website. That is where a page builder comes into the picture. 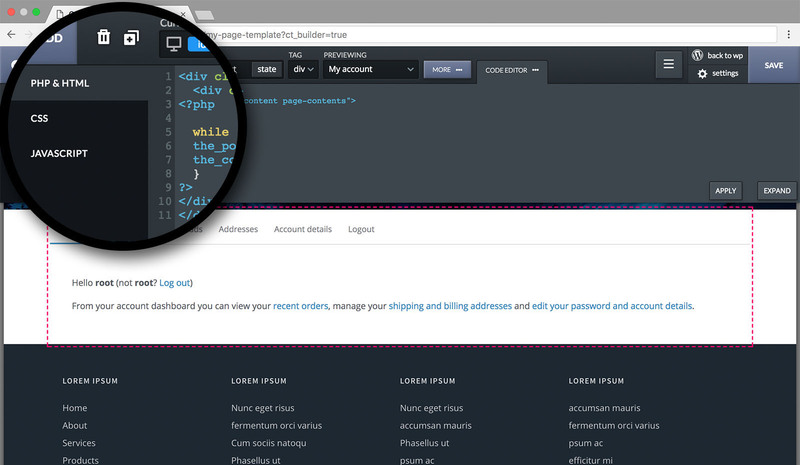 A page builder lets you customize the layout of your website without writing any code. Beginners who don’t know how to code and users transitioning from other page builder platforms to WordPress wish to have a page builder to help create their website. Most page builders in WordPress allow you to make changes to the styles and scripts of your website. As a result, they add a whole lot of bloated code in all the pages of the site. But there are some page builders which are carefully built to avoid just that. 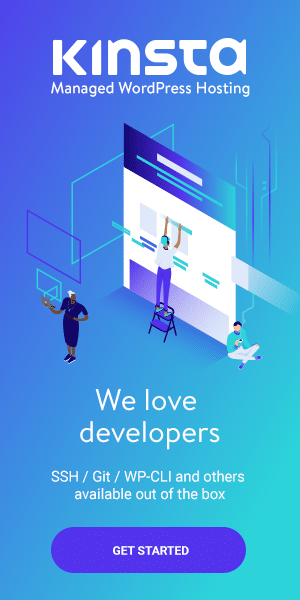 Today, I am going to review a page builder — Oxygen — which helped me in getting over my fear of bloated code as far as page builders are concerned. Oxygen is a WordPress Page Builder which helps you design beautiful WordPress websites. Its Design Set has a lot of components and pre-built example websites to get you started. Louis Reingold launched this product just over a year ago. His motivation behind this plugin was straightforward. He wanted a page builder with the power to make tweaks to CSS and PHP files without ever opening an FTP software. In his Letter from the “CEO,” he talks about his vision which led to the birth of Oxygen. I wanted to be able to control everything visually, right from inside WordPress. And I wanted to be able to see what I was doing, live. 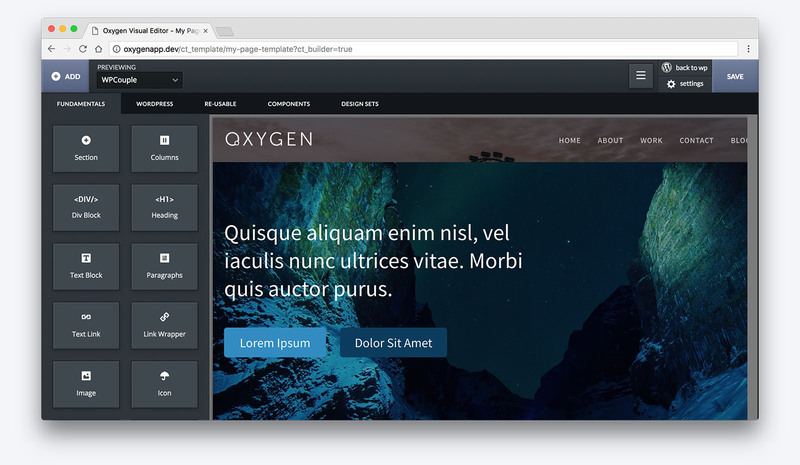 Like every other good page builder, Oxygen comes with a feature-rich palette. Fortunately, Oxygen provides many of these features which other page builders do not offer. Let’s discuss a few highlighted features, shall we? Oxygen has one of most impressive visual design interfaces I have ever seen. You can get the hang of it within a matter of minutes. It adds a main menu bar at the top of your page. You can perform all kinds of operations from the visual editor like adding new components, styling, adjusting their position, etc. Their team has put a lot of effort in making tutorials for their customers. To learn about how you can get started with the building blocks of Oxygen, check out their course → Essential Building Blocks of Modern Websites. With Oxygen, you can have different designs for different types of pages. For example, you can make a template which only applies to a page template with News category. Just go to WordPress Dashboard > Oxygen > Templates and click on the Add New button. A new page will open. 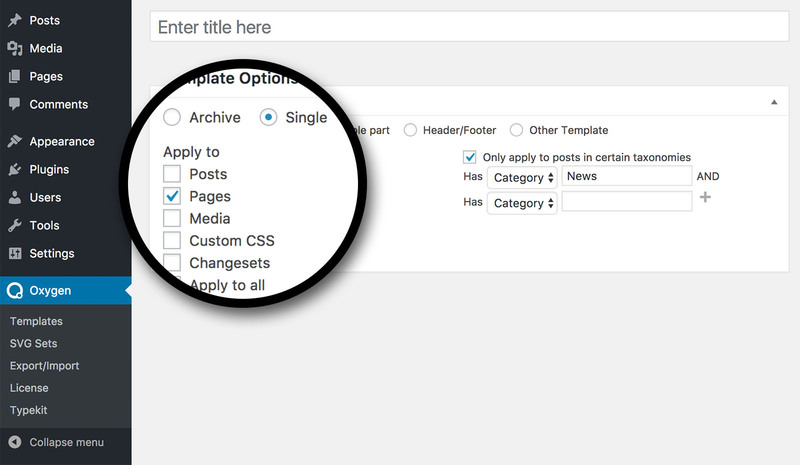 From Template Options, select Page and check the box saying, “Only apply to post in certain taxonomies.” That’s it; you’re good to go. Gone are the days, when you needed to customize some content from the plugin and your choices were to either add custom CSS style rules in the customizer or override the template files provided by the plugin like in the case of WooCommerce. Oxygen lets you customize such contents as well. You just need to open the page builder. Contents of the page will be present inside the designer. After that select the element you want to edit and apply desired customizations. Yes, you read it right! There is a live code editor present inside the visual designer of Oxygen. It lets you use WordPress functions so that you can perform code changes to your content and watch the changes right away. To access the code editor, click on Code Editor button sitting in the toolbar of Oxygen at the top. A customization block will open. It lets you customize three types of codes. ⚙️ How Does Oxygen Works? It comes with two add-ons. The first one allows you to detect the selectors present in the web page while the second one integrates Adobe Typekit tool with Oxygen. Oxygen itself adds a single menu to the WordPress Dashboard menu.  Point + click plugin styling: Just point and click to start styling anything on your website with this page builder. Create layouts for everything, visually: Build custom layouts for all kind of data, say EDD listings, WooCommerce products, or anything at all. Preview & visually style dynamic content: No guesswork, your designs are pretty much updated live — that’s a benefit. 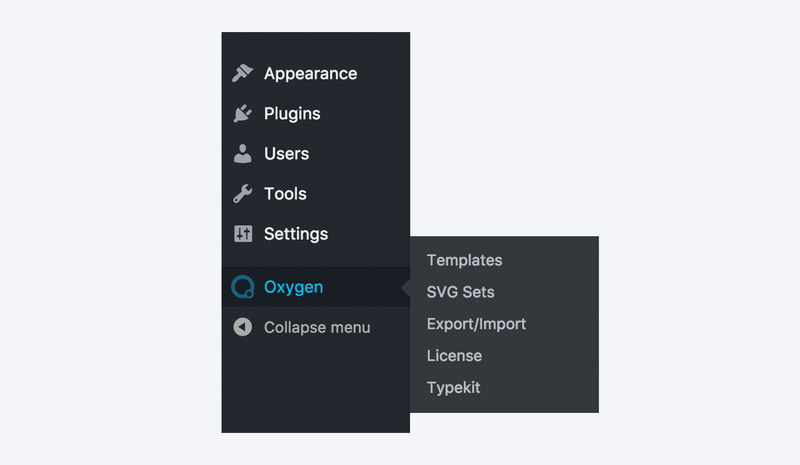 Oxygen also allows you to add SVG icon sets, import and export your settings and manage your Typekit settings from this menu. I have worked with my fair share of page builders to realize that Oxygen is way better than others regarding speed and efficiency. It takes seconds to save a template whereas others might take more than your coffee break. Yep! Oxygen also has a lot of built-in components. You can use these elements to set up a website within minutes. You can even customize any of these parts using its visual designer. The code editor of Oxygen is dope. IMHO no other page builder is capable of editing WordPress code the way Oxygen does. 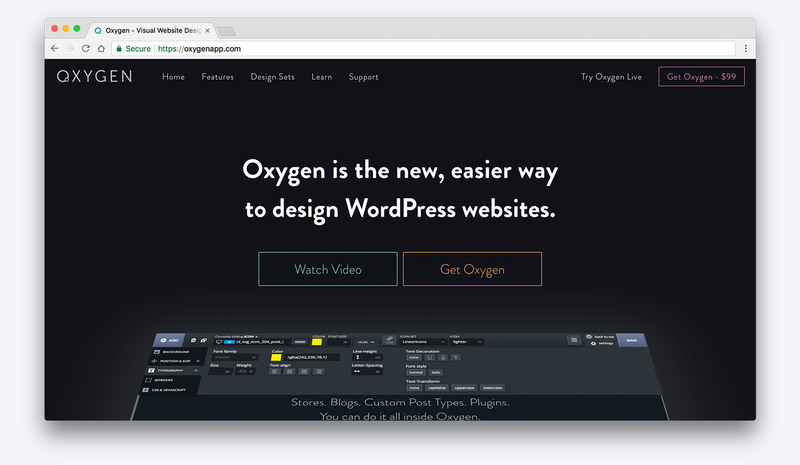 While Oxygen lets you edit WordPress code live from the visual designer. I think this is an incredible offer. You can go here to buy Oxygen page builder. 🤔 One Thing Wrong With Oxygen! If you ask me, I think there is a huge problem with how Oxygen is being marketed. I’m not going to go into the details here but the fact that everyone only talks about Elementor and Beaver Builder and new page builders like Oxygen get less facetime — can mean only one thing. Things need to change when it comes to marketing this product. If that happens, I’m pretty sure people would love to use Oxygen.  It has a unique proposition and it definitely works differently as compared to what WordPress users are normally used to. 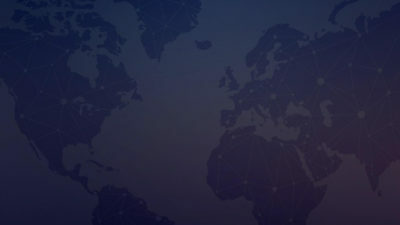 I’d suggest the team behind Oxygen to build small, bite-sized, gulp-able facts via GIFs and Videos to introduce key values of their product to the community. 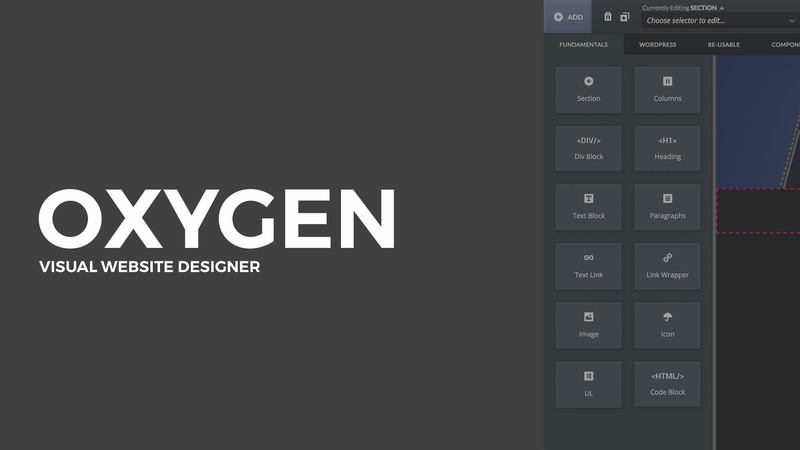 Oxygen is by far the most straightforward page builder I have ever encountered. The fact that it helps me live design data, generate data from different plugins and design a pixel perfect site with content from third-party plugins is just amazing. After toying around with it for a while, I would definitely recommend this plugin to the users who are looking for a good page builder. I even took a look at the core code of the builder’s plugin and it seemed pretty clean and well coded. Are you already using Oxygen? Or maybe you’re planning to get it for your website? In either case, do let us know about your experience with Oxygen using the comment box below.